The tension in the room rose at the accusation. The rest of the board fell silent as the executive gathered his composure and interrupted his presentation to explain his rationale for the target. The other directors had enormous respect for the EVP, and considered him a likely successor to the CEO. Yet they let a fellow director to talk down to him and put him on the defensive. Repeatedly. Such interactions are increasingly common in boardrooms. Other board members roll their eyes, but no one intervenes to help the highly regarded manager, who is under attack. “George is off again on one of his rants,” they think dismissively. Not surprisingly, executives at the company hate making presentations at board meetings. “George” (not his real name) keeps them on the defensive by peppering them with opinions and goals that can’t be met. He doesn’t listen, the executives say. He doesn’t ask questions or make constructive suggestions. He just pontificates and directs. His intimidating tone says he knows you’re wrong, no matter what you say. George considers himself an expert on productivity management, but his condescending attitude and unnecessary use of time makes the entire board unproductive. At a time when boards have to be increasingly effective, he drains energy from the other directors, as well as from top management. Worse, he detracts from critical issues into which the board needs to drill. He is a “dysfunctional director,” and I’m sure you’ve seen some version of such behavior. Let me be clear: We’re not speaking of directors who disagree with management strategy or have alternative suggestions. We’re not even talking about hostile directors forced onto the board by someone trying to take over the company. Dysfunctional directors have their own motivations. Some see themselves as the smartest person in the room; others seek recognition. Many are driven by ego. To satisfy their needs, they try to micromanage in the boardroom. They take the discussion down an alley or unnecessarily into the weeds. It is my experience that about one-third of top companies have one or two such dysfunctional directors. Compromising board effectiveness is not an inconsequential problem, and it is one that boards must solve for themselves. The board cannot help a company if its composition is faulty and directors can’t work together. Some CEOs try to intervene, but winning the battle doesn’t mean winning the war. In some cases, where confrontations between the CEO and a director led the CEO to ask the board to make a choice, the director left but the CEO’s relationship with rest of the board was never the same. Indeed, many boards would find it easier to vote against the CEO than a director. It doesn’t take more than a couple of people to make the whole board seem dysfunctional—and CEOs don’t always see the root of the dysfunction. It’s only when you ask them to dissect the meeting—who said what, how they said it, and what they did—that the CEO realizes that the problem lies not with the whole board but with just one or two directors. Even when the CEO and fellow directors see who is at fault, they often don’t know what to do about it. At a health insurance company, a director, who was passed over for the CEO position at his own company and later joined a private equity firm, peppers the new CEO with minor suggestions at every board meeting. The lead director and the chairman of the nominating and governance committees know “John” is wrong but say nothing. At another company, an academic who is a director of a successful financial services company thrives on telling management that their strategy isn’t good enough. His antagonistic tone indicates that he is the expert and that management is incompetent. He insists that the strategy be expressed in a single, compelling sentence. “We’ve gone through this strategy three times and we still don’t have a strategy,” he has been quoted as saying. “I think management really doesn’t want to make bold moves.” He keeps management on the defensive, never offering praise but often criticizing. It is a search for power. A final example: A highly intelligent board member says little for much of the board meeting at a logistics services firm. Then she injects some data or information she has had since the beginning or points out a flaw in someone else’s argument from much earlier. Several hours of discussion are suddenly rendered irrelevant. Worse yet, she offers a viable but complex solution to a problem, which requires days of research and an entire new board meeting to discuss. She clearly enjoys creating such disruption because it gives her power over others. None of these examples—and there are dozens more—affect the most pressing issues the company is trying to address. One might almost call the behavior mischief-making, except that is not the point. Rather, these dysfunctional directors are stressing their importance as people. They seek status by nitpicking. For them, it’s like the Inquisition. The constant barrage of the same questions and frivolous arguments wears down the board and puts management on the defensive. Increasing the effectiveness of the board—and therefore the company—is almost beside the point. Unfortunately, some managements end up creating a two-tier board. To satisfy one person, management tunes presentations to that person’s whims. To prevent problems in the boardroom, they often consult him or her beforehand. That’s a terrible drain on time and energy for management and for the rest of the board. For the dysfunctional director, that’s okay, too, because it shows his or her importance. Similarly, at the depths of the recent Great Recession, the chairman of the finance committee of the board of an automotive parts company recommended a cut in the company’s dividend to conserve cash. The CEO argued that there was no need; there was enough cash-flow to pay the dividend and a cut might panic shareholders. His argument prevailed with the board, not once but several times. Eventually, the finance committee chairman apologized to the CEO for his own persistence and complimented the CEO on his tenacity. In these examples, as in others, the disagreements with management were sincerely held, and the boards were thoroughly engaged. Sometimes, the board’s position prevailed. At other times, management’s arguments persuaded. Differences of opinion were expressed without embarrassment. In my experience, a major reason is the culture of directorship. Collegiality and board harmony are important, and the universe of independent directors is small. Board members don’t want to offend a fellow director. They want to be respectful of each other. Few people want to be known as the board member who told another to stop talking, and fewer still are strong enough to hold such directors to account. But it can happen. In one instance, the president of a company was making a presentation. “Charlie,” a recently elected director trying to make his mark, kept interrupting the presentation with minor questions and a caustic tone. The lead director was highly respected by all. After his suggestion that Charlie defer the discussion to the executive session was brushed aside, the lead director said, “Charlie, do you want his job?” That ended the confrontation. However, not many lead directors exhibit such backbone. The solution to dealing with dysfunctional directors is, bluntly, to remove them from the board. That’s easier said than done. For the same reasons directors won’t intervene during board meetings, they won’t vote out a dysfunctional director. A personal vote against a director under such circumstances is likely to create very hard feelings and sometimes even animosity in this close-knit circle. There is no graceful way to get a director off the board. Sometimes it is done, but clumsily. A U.S. company that was at the top in its industry had a foreign director who had been CEO of a similar company overseas. The director had a habit of pontificating on issues the other directors found irrelevant, and they found his philosophizing overly time-consuming. Eventually, the board mustered the courage to force him to step down. The director wept when he was voted out, and shortly thereafter he sent the directors an angry letter, pointing out that they had disregarded the value of his vast European network and deep business knowledge. It doesn’t always have to end that way. One CEO spoke to a dysfunctional director about his behavior at meetings. The director completely changed his behavior, and the CEO says he is now one of the best directors on the board. However, such occurrences are rare. That is why it’s so important to select strong lead directors to carry out the sense of the board. Moreover, best practice requires a robust evaluation process to create a world-class board that can help guide a company in times of stress and rapid change. Boards must function well to have a positive impact on the company, so they must have an explicit process to deal with dysfunctional directors. [See box, p. 59.] The process should be put in place before problems occur; because in a fast-changing world, a company can go over the cliff in less than two years—and then it will be too late. For examples, just look at some well-known companies around you. Ram Charan, 72, has been described by Fortune as “the most influential consultant alive.” Born and educated as an engineer in India, he received an MBA from the Harvard Business School, where he was a Baker Scholar. He then earned a doctorate from Harvard in corporate governance in 1967. His thesis topic was “Boards of Directors.” He taught at Harvard Business School and was an award-winning professor at the Kellogg School at Northwestern University before becoming a consultant, strategic advisor and executive coach in 1978. 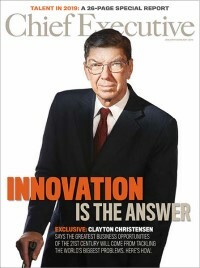 A former director of Austin Industries and Tyco Electronics, he currently serves on the board of Hindalco. This India-based company is one of the world’s largest manufacturers of aluminum. Ram Charan is a world-renowned business advisor, author and speaker who has spent the past 35 years working with many top companies, CEOs and boards.